Wife of Prime Minister Winston S. Churchill and a Peeress in her own right. TLS. 1p. 10 Downing Street, Whitehall. 1st October 1953. To Mr. Burdett. "I feel much complimented that you should invite me to present the prizes at your Annual Ceremony. I wish very much I could do this, but I am obliged for reasons of health to limit the number of my public engagements; and my time-table for October is already more than full. Please accept my thanks for the honour you have done me." With good full autograph signature. 4to. Approx 8.75 x 7 inches. Fine. 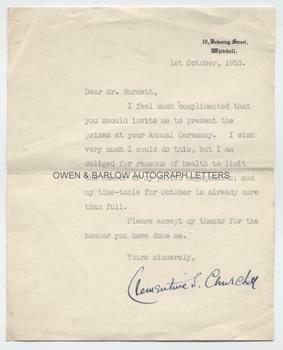 Other documents from the same source suggest that Clementine Churchill is here writing to Lt. Col. J.C. Burdett, a one-time Director of the Prince of Wales Hospital and it is possible that the invitation may have been in relation to the Nurse's School.